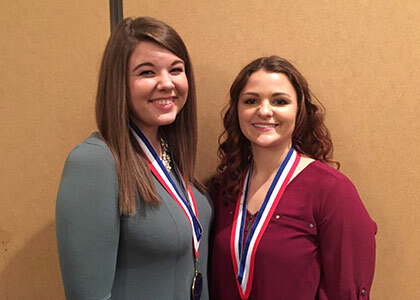 Cowley students Ashley Huslig, Alpha Gamma Upsilon’s President, and Kyndal Dutton, Alpha Gamma Upsilon’s Vice President of Scholarship, were honored in Topeka February 16 during the Annual Phi Theta Kappa Honors Luncheon among representatives from 20 community colleges in the state. These scholars were named to the 2017 All-Kansas Academic Team, sponsored by Phi Theta Kappa International Honor Society and the Kansas Association of Community College Trustees. Huslig will transfer to Wichita State University, majoring in nursing, and Dutton plans to transfer to Newman University, also majoring in nursing. They will be honored locally at the Induction and Academic Team Ceremony on April 23 at 3 p.m. in the Earle N. Wright Community Room. Each student received a certificate, an educational scholarship of $300, and an academic medallion. The All-Kansas Team recipients will also receive a minimum of a $1000 scholarship for transfer to a number of participating institutions. Other Cowley dignitaries at the luncheon were: vice president of academic affairs, Dr. Harold Arnett; Board of Trustees member, Jolynn Foster; vice president of institutional advancement, Dr. Kori A. Gregg, executive director of student affairs, Jason O’Toole; and PTK advisors, Scott Layton and Deborah Layton. The keynote speaker Rev. Dr. Jamie Washington, also known as “The Engagement Specialist,” gave an inspiring speech motivating students to ground themselves, to get a vision for the future, to make connections, to finish strong and to celebrate, all to leave the world a better place. He also encouraged students to move beyond their comfort zones and to see “mistakes as unplanned learning opportunities” and to “quiet the voices of limitation” that tell them they are not enough. Phi Theta Kappa is an internationally recognized honor society for students attending community and two-year colleges. Membership is based on high grade point averages and good standing, with members focusing on leadership, scholastic achievement and service to community and campus.